Earn $0.89 in VIP credit (89 points)What's This? 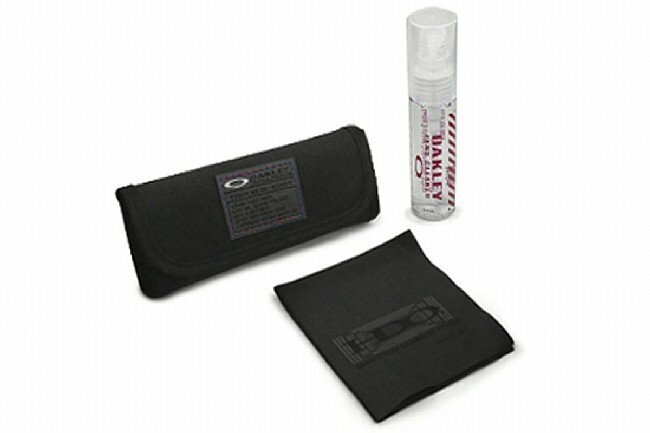 Keep Oakley's high-quality optics working their best by keeping them clean with this Lens Cleaning Kit. It includes a 1 oz spray bottle of alcohol-based cleaner and a Microclair® polishing cloth to remove dirt and buff out the shine. A velcro travel pouch provides an easy way to keep the kit together and to prevent contamination of the cloth. Manufacturer note: This Oakley Lens Cleaning Kit is specifically formulated for Oakley eyewear. Not for use with Oakley goggles, eye shields, or anti-fog treated lenses.